and may set a precedent for others. The dams block access to some 5,500 miles of historic salmon spawning. ALMOST FROM THE moment they were completed in 1975, four hydroelectric dams on the Lower Snake River in eastern Washington State have been a key focus of dam removal advocates, including environmental groups, commercial fishermen and Native American tribes. A recent court decision might be their biggest victory yet. The four dams -- Lower Granite, Little Goose, Lower Monumental and Ice Harbor -- are all located near Walla Walla, Wash. They are among 31 dams on the larger Columbia River hydropower system that provide electricity, water and transportation in four states. The Snake River is the Columbia's largest tributary, and together -- before the dams were built -- the two rivers once offered one of the most productive salmon habitats in the world. On May 4 in Portland, Ore., U.S. District Court Judge Michael Simon ruled in favor of environmentalists, fishing groups and tribes, which challenged the federal government's recovery plan for 10 species of endangered salmon and steelhead in the Columbia River system. He found that the plan, which focuses heavily on upstream habitat restoration, fails to fully account for the role the dams have played in the demise of salmon in the watershed. Simon ordered NOAA Fisheries and its sister "action agencies" to prepare a new environmental impact statement on their salmon recovery plan, under the terms of the National Environmental Policy Act. In his ruling, the judge called dam removal a "reasonable alternative" that should be analyzed by the government as a salmon recovery option. "This is an action that NOAA Fisheries and the action agencies have done their utmost to avoid considering for decades," Simon wrote. Those action agencies include the U.S. Army Corps of Engineers, which operates the dams, and the Bonneville Power Administration, which markets the electricity they generate. The Snake River dams are a focus of so much attention because they restrict access to some 5,500 miles of historic salmon spawning habitat in Idaho. This is mostly high-elevation, cold-water habitat that could provide an important refuge for salmon as the climate warms. Judge Simon also criticized the government for failing to consider the effects of climate change on salmon recovery. As a result, his ruling could become a precedent in numerous other legal challenges to dams around the West, which share many key issues with the Columbia and Snake dams. "This comprehensive ruling is creating what could be our largest salmon and river restoration probably on the planet," said Joseph Bogaard, executive director of Save Our Wild Salmon, one of the plaintiffs in the court case. "It's a big deal." Terry Flores, executive director of Northwest River Partners, a defendant in the case, agreed the ruling is a "big deal." She noted the law prevents Judge Simon from ordering the federal agencies to study dam removal, but the fact that he strongly implied they should is significant -- and probably means they will. She also called it significant that the judge rejected habitat restoration as the primary answer to salmon recovery. This restoration in particular involves a billion-dollar commitment over 10 years to improve habitat in the Columbia and Snake watersheds by the Bonneville Power Administration -- funded by its millions of ratepayers in the Northwest -- making it the largest restoration project of its kind in the nation. The habitat restoration effort includes 72 measures that were negotiated by a broad spectrum of players in the region, and was viewed as an important partnership. The average residential utility customer in the Northwest has been paying as much as 20 percent of their electric bill towards these salmon habitat projects. "To say we're disappointed is putting it mildly," said Flores, whose group represents electric utilities and other industries that rely on the dams. "This, potentially, is a national-impact court ruling under the Endangered Species Act. There really are some critical legal issues that are in play." The dams have fish ladders that allow adult salmon to migrate upstream for spawning. The juvenile salmon they produce can migrate downstream to the ocean using spillway weirs or "slides" installed over the past decade. These allow the small fish to ride a layer of fast-moving water that passes through the dams. Flores said survival is 95 percent or better during juvenile salmon passage through the dams, demonstrating that they are no longer a significant threat to fish. Bogaard disagrees, noting those figures don't account for fish survival between the dams, or cumulative survival during their whole migration. Many fish are killed in the reservoirs behind the dams by warm water, predators and pollution. As a result, he said, less than half of migrating juveniles survive to reach the ocean. 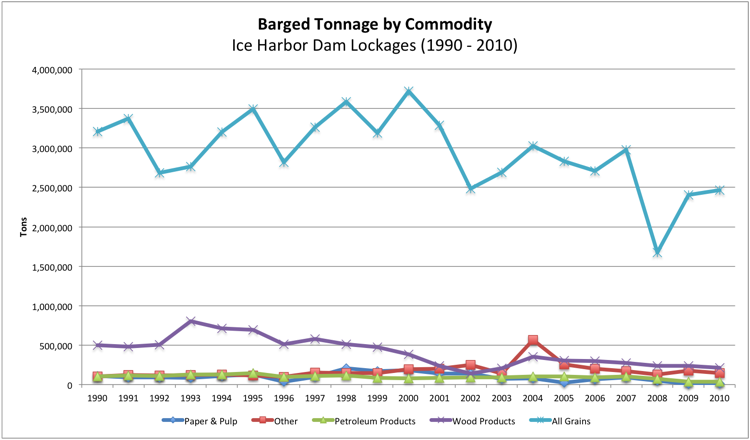 Only one of the dams -- Ice Harbor -- has a significant role in water delivery. It impounds irrigation water for about 35,000 acres of nearby farms under water rights that predate the dam. These farms could still access that water if the dam was removed, although new diversion works would have to be built. Electricity production has broader implications. If there dams were removed, they would no longer contribute to the region's hydroelectric power supply, generally viewed as a clean and carbon-free energy source. The four lower Snake River dams produce about 4 percent of the region's electricity. Bogaard says this occurs primarily in the springtime, when flows are greatest during snowmelt. The dams generate little energy the rest of the year, he said, and their total output could be replaced by renewables such as solar and wind at a cost of only about a dollar per month to most ratepayers, he said. Flores disputes this. She says the loss of the dams would require building natural gas power plants or purchasing energy from the grid, which would increase costs and greenhouse gas emissions. The dams also include navigational locks that allow barges to move cargo -- mostly farm commodities -- up- and downriver for hundreds of miles. But Bogaard said such traffic has declined 70 percent over the past 15 years in favor of rail shipment. Fees charged on those shipments once helped subsidize operations and maintenance of the dams. Now those costs fall more heavily on federal taxpayers and regional electricity ratepayers. "The economics of the dams are changing quite a bit," Bogaard said. "There are a lot of reasons why dam removal makes the most sense." David Wilson, a spokesman for the Bonneville Power Administration, said early steps to prepare a new environmental impact study on the dams, as directed by Judge Simon, have begun. A website explaining that process and laying out a timeline and public comment opportunities is expected to be unveiled this fall. Flores views the issue of dam removal as somewhat academic. That's because even if the new environmental impact study comes back in support of dam removal as the best solution for salmon, that won't make dam removal happen. "It would literally take an act of Congress to remove them and appropriate dollars for their removal," Flores said. "And most of the folks in our Northwest Congressional delegation see the value of these dams -- especially in a time of climate change concerns -- and the value of the navigation and lock system."